Prokaryote cells were the first life form to appear on Earth, 3500x106 years ago. Prokaryote means before the nucleus, which means they do not have DNA enclosed by an inner membrane. Prokaryotic cell organization is quite simple: a plasma membrane confines an inner space where chemical reactions take place. They also have a capsule lining the extracellular surface of the plasma membrane. Furthermore, protein structures like flagella and pili, for movement and DNA interchange, respectively, can be sometimes observed. Prokaryotes were the only cell type at the beginning of life on Earth. Two main groups of prokaryotes are known: bacteria and archaea. Eukaryotic cells appeared 1500-2000x106 years ago. It is about 1500x106 later than prokaryotes. The cell organization of eukaryotes was something new on Earth, showing so many innovations that opened new evolutive ways not explored by living forms so far. In evolution, these breakthroughs are known as evolutionary transitions. Eukaryotic cells reached a complex morphological organization, including internal membrane-bound compartments, nucleus as a key component, and built a sophisticated cytoskeleton. They also were able to incorporate a huge amount of external DNA, whole genomes that gave rise to mitochondria and chloroplasts, discovered sexual reproduction, and, by grouping together, gave rise to a new type of life form: pluricellular organisms, which independently appeared several times during evolution. Et is not known how the first eukaryotes emerged, but it should have happened as a result of the collaboration between the two cell types present at that time: archaea and bacteria. 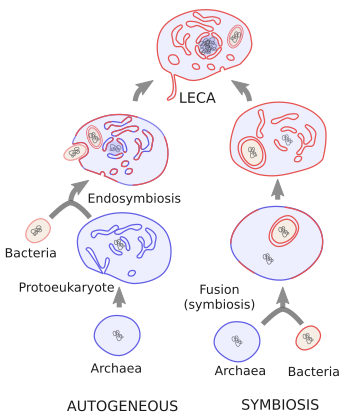 Eukaryotes are monophyletic, which means that all of them, including plants, animals, fungi, algae, and unicellular eukaryotes, descended from a common ancestor known as LECA (last eukaryotic common ancestor). So, with the evidences we have today, the eukaryote cell was "invented" just once during evolution. The comparison of cell genomes of today phylogenetically distant eukaryotes suggests that LECA had a genome as complex and rich as the genome of the current cells, and probably it had similar morphology and structure. There is no doubt LECA evolved from prokaryotes, but from which one, bacteria or archaea? Choosing one of them is not easy (Figure 1). Current eukaryotes are like chimeras because genes from both types of prokaryotes coexist in the same eukaryotic nucleus. For example, genes involved in processing eukaryotic DNA, like replication, transcription and translation (known as informational genes) are more similar to those of archaea, while those genes in charge of the eukaryotic metabolism, like energy and synthesis of aminoacids, lipids and nucleotides (known as operational genes), are more similar to genes of bacteria. To get things more complicated, even the archaea-like genes may have come from different groups of archaea. Figure 1. Two theories about the emergence of eukaryotes. A) Eukaryotes emerged from a branch of archaea by a progressive increase in morphological complexity that ended up as a proto-eukaryote. Later, proto-eukaryote engulfed an alfa-proteobacteria that developed into mitochondria, and this cell was LECA (last eukaryotic common ancestor). B) LECA appeared after the fusion of an archaea and a bacterium, without previous proto-eukaryote forms. It means that eukaryotes arose as a mix of the two types of prokaryotes. LUCA (last universal common ancestor) was the first cell that gave rise to all the cell types on Earth. Phylogenetic studies (comparison of DNA sequences) suggest that eukaryotes emerged from a group of archaea named as Asgard group, which has been recently discovered. This group includes the lokiarchaeas. They have been found to be the prokaryotes most closely related to eukaryotes when comparing informational genes like those involved in metabolism and DNA processing. Furthermore, some authors suggest these genes are mainly transmitted through generations of descendants instead of being transmitted horizontally (between non related cells). That is why these genes are good tools to determine more accurate evolutionary relationships between organisms. Lokiarchaeota also has genes homologous to those eukaryote genes related to cytoskeleton and membrane remodeling. Curiously enough, although a lokiarchaea cell is yet to be seen, it has been guessed by metagenomic analysis. To do this, water close to hydrothermal vents was collected and the DNA it contained was studied: it was sequenced and assembled. So, we have the DNA, but not the cell yet. This environments are poor in oxygen, suggesting that the eukaryote ancestor lived in anoxic waters. Only after they got oxygenic bacteria as endosymbionts (the future mitochondria) they were able to populate more oxygenated places. Since lokiarchaeas are not been observed, their structural complexity or even cell size can not be compared to those of eukaryotes. Symbiosis model (or 3D model). This model proposes the direct fusion of an archaea and a bacterium, which means there is no protoeukaryote. In this scenario, two distant branches of the tree of life getting fused, leading to the emergence of a completely new branch of cells. There are some evidences supporting this proposal. Nowadays, the presence of bacteria containing other prokaryotes as endosymbionts has been described. The fusion event boosted the increase in cellular complexity, the bacterium became the mitochondria. Both cells shared different cell activities: archaea were in charge of DNA and bacteria dealt with metabolism. There is another version of this model in which there was no starting endosymbiosis event, but a long period of time where these two cells cooperated together. During this time, horizontal gene transfer (interchange of genes) was possible because they were spatially close. In this version of the model, the hydrogen hypothesis is suggested. The bacterium produced hydrogen for the archaea metabolism, and archaea produced organic molecules for the bacterium. Finally, the bacterium was included into the archaea, which already had many bacterial genes. How this endosymbiosis took place is not clear yet. Phagocytosis as the process for endosymbiosis has been assumed, but there is no experimental evidences for this. Autogenous model (2D model). Protoeukaryotic cells arose from a group of archaea by progressive increase in complexity, so that it somehow became similar to modern eukaryotes. These cells had an endomembrane system, a nucleus, and a cytoskeleton, but no mitochondria. They were able to feed by phagocytosis. In one occasion, they engulfed an alfa-proteobacterium that was not digested and became an endosymbiont therefore representing the ancestor of current mitochondria. With the passing of time, many genes from the endosymbiont were transferred to the nucleus and they took the control of the cell metabolism, but not the handling of DNA. However, intermediate forms between eukaryotes and prokaryotes have yet to be found, and, even more relevant, eukaryotic cells without mitochondria have not been discovered (there are some eukaryotic cells without mitochondria, but they have other organelles derived from mitochondria). Archivald, JM. 2015. Endosymbiosis and eukaryotic cell evolution. 2015. Current biology. 25: R911-R921. Dey G, Thattai M, Baum B. 2016. On the archaeal origins of eukaryotes and the challenges of inferring phenotype from genotype. 26: 476-485 . López-García P, Moreira D. 2015. Open questions on the origin of eukaryotes. Trends in ecology and evolution. 30: 697-708 . Martin WF, Neukirchen S, Zimorski V, Gould SB, Sousa FL. 2016. Energy for two: new archaeal lineages and the origin of mitochondria. Bioessays 38: 850–856 .